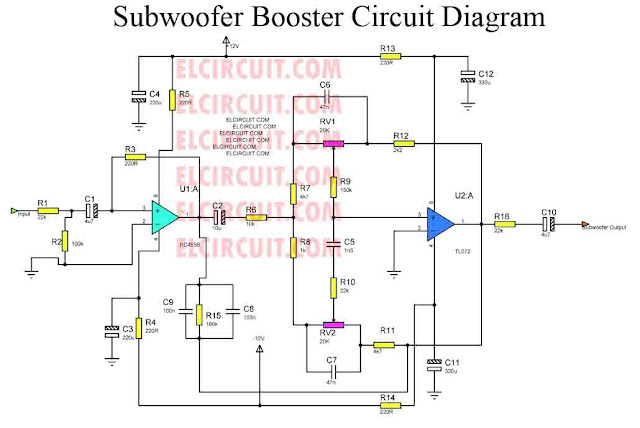 Subwoofer booster circuit is used to enhancing or boosting or increase the subwoofer amplifier, but it also can improve the quality of the bass sound on an amplifier or High Power Amplifier. 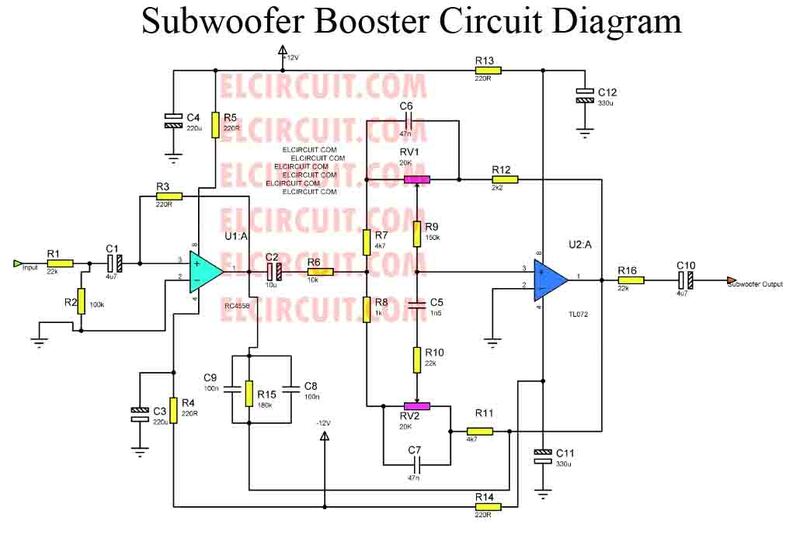 Subwoofer booster circuit/bass enhancer circuit based on the IC 4558 and TL074 or commonly known as IC op-amp, it's suitable to be a boosting in subwoofer system, which together with some components. 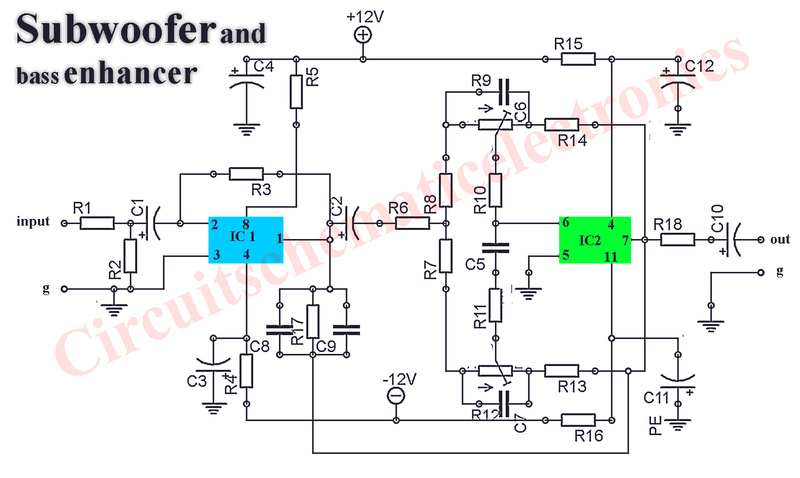 For this subwoofer booster/enhancer circuit using voltage of 12 V +, 12V -, and ground. 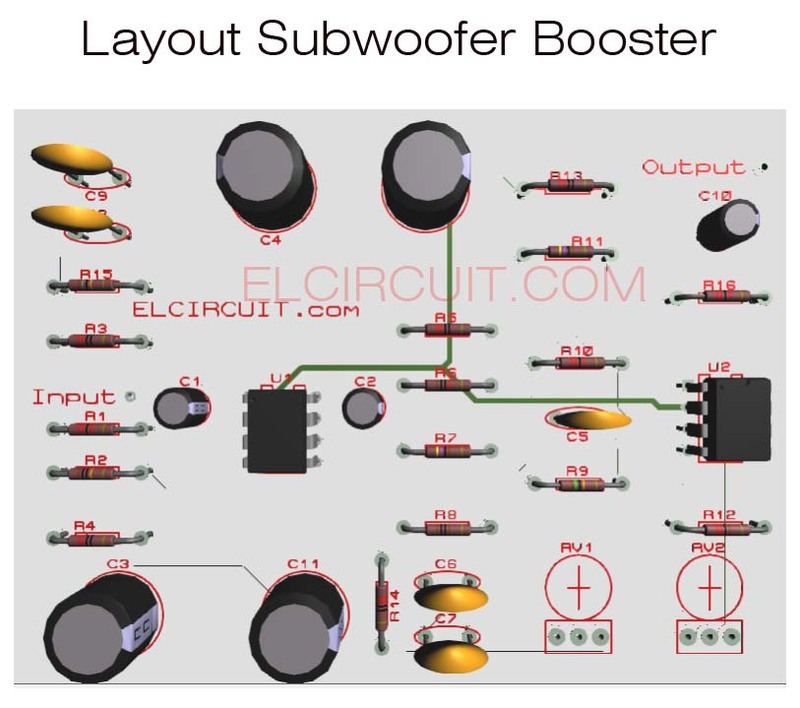 To be in accordance with the power of the speakers and amplifiers, the Subwoofer booster circuit/subwoofer enhancer is also equipped with a subwoofer volume setting on the R9 and R12 use 20 K ohm trim. Issued a circuit of subwoofer output is quite high, making it suitable for some speakers. is -12v connected to ground ? hello ebin, you can see clearly schematic circuit diagram subwoofer booster on end post. if you have proteus, you can download the schematic and layout for more detail connection board. 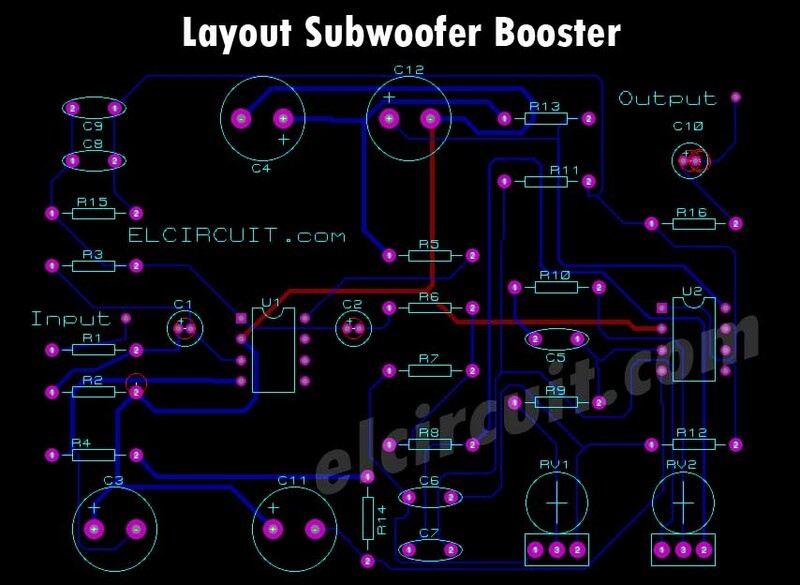 you can see now, the pcb laout subwoofer booster. if you want to download proteus file, please sign in google account before. Mas Wahyu yg ganteng, saya dah bikin tuh rangkaian. Saya punya speaker aktif 2.1. Dah saya pasangin giga bass sebelum tone control tp saya belum puas di subwoofernya. Kalau mau saya pasang di speaker aktif saya, urutannya gimana mas? setelah tone control, seblum power mas. you must make it two kit for stereo sir. 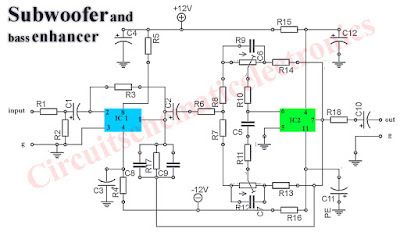 HELLO I WANT YOU TO HELP ME WITH A TL074CN I HAVE IT IN CIRCUIT THAT IS FOR TWO SATELLITES AND A WOOFER BUT I WANT TO MODIFY IT FOR TWO SUB WOOFER. if the output is too high, you can modify the circuit by replacing c8 and c9 100n with 470n. you can try it. 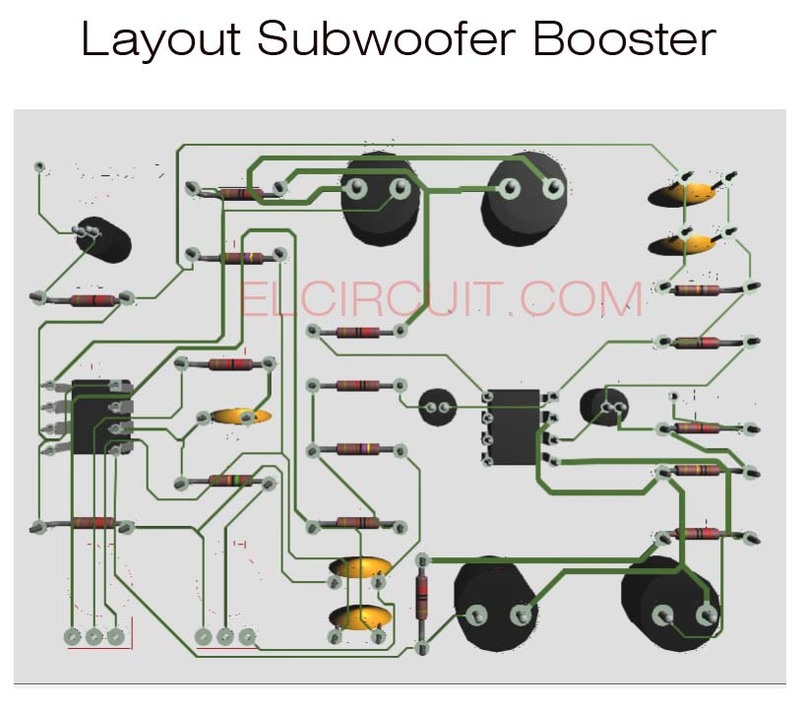 this circuit can be using on 2 subwoofer, what the njmber of your amplifier? okayy thanks dude, hope you enjoy in here.